I like it when web developers try to enhance interaction between their application and its users, but when it doesn't work, they just look silly. Take the email I just got from Plaxo, for example. Plaxo sent me an email to inform me of pending connections that they want me to accept. But because of the fact that I don't like receiving anything anything but messages from humans, I decided to unsubscribe. Because of the large number of types of email alerts you can subscribe to, Plaxo cleverly tells you what type of email you clicked from to get to the page. It highlighted "Plaxo user surveys," indicating that I had just received this type of message. Unfortunately, this was not the type of email I received and I was already unsubscribed to the type of email alert it highlighted for me. (The type of email alert it should have highlighted was the one below it, "Digest of outstanding connection requests." Despite the fact that they got it wrong, I like the idea of telling you which type of email alert you clicked from. Once Plaxo irons out the bugs (I originally saw this error a few months back, and it just happened to me again), this interface enhancement will be pretty useful, and I hope other companies will follow suit. 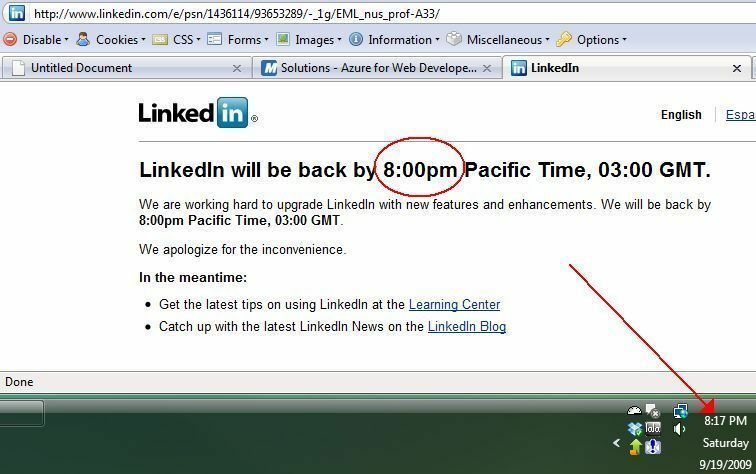 LinkedIn tries to be a little too specific with their downtime estimate...and fails. Hey LinkedIn, let's try being a little less specific next time, shall we? On a side note, I find it funny that they're down for the 20 minutes I try to access the site, and I only visit about once a month.